A casual reader, seeing The Hebrew Republic on a store shelf, could be forgiven for misunderstanding what kind of book it is. It has the same title as Bernard Avishai’s recent plea for a new, globalized politics in Israel. For people interested in the rightward shift among American and European Jews, the book’s title may evoke the long-running debate about the religious or cultural roots of the Jews’ historic commitment to liberalism. 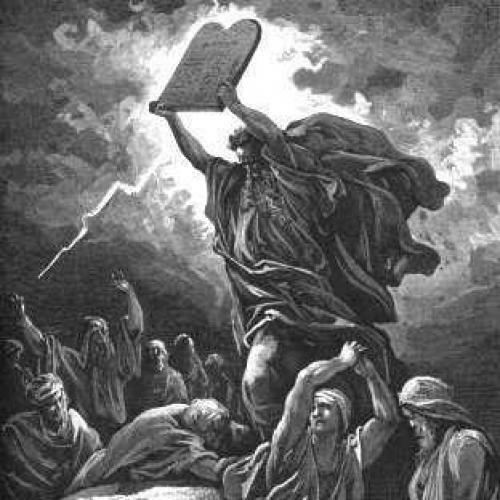 For the truly inattentive, the bearded Moses pictured on the cover pointing to the Ten Commandments may suggest yet another study of the religious right and its origins. The Hebrew Republic is none of these things. Eric Nelson’s magnificent book is a trim and incisive scholarly history that aims to show how something called the Hebrew Republic “transformed political thought” between the sixteenth and early eighteenth centuries. The Hebrew Republic, imagined by Christian scholars during that golden age of new thinking about politics, was a reconstruction of the Israelite state described in the Bible. Its constitution, they believed, had been given directly by God and as such was a model of the perfect polity. Nelson argues that the discovery of this mythic civic past helped European political thinkers to establish three of the modern West’s “fundamental ideals”: the superiority of kingless government; the right of governments to redistribute wealth; and religious toleration. For the history of Western politics, this makes the story of the Hebrew Republic momentous indeed. From the perspective of Jewish law there could be no doubt about the conclusion of the debate: the position of the Talmud, which held that having a king was obligatory, was clearly the controlling precedent. But Christian thinkers, untroubled by Jewish hermeneutic rules, could take seriously either of the mutually exclusive opinions. Scholars and soon political polemicists as well began to divide into camps, defined by the pro- and anti-monarchic theses presented in the Jewish sources. When John Milton sought in 1649 to justify the creation of an English Republic, he used the opinions in the Midrash to formulate what Nelson calls republican exclusivism, the notion that only kingless government is legitimate. Taken up and developed by other writers, including Algernon Sidney and James Harrington, republican exclusivism based on Jewish sources became a cornerstone of anti-monarchic polemic in the seventeenth century and enjoyed a brief but important revival in the era of the American Revolution. The Hebrew Republic, Nelson continues, also provided a part of the intellectual justification for republican theorists to embrace redistribution of property. The Roman authors whom European thinkers had idolized during the Renaissance condemned redistribution as a dangerous violation of individual rights. But as Christian Europeans in the seventeenth century began to pay closer attention to the Jubilee year—Biblical legislation that called for all Israelite property to revert to its original owners every fiftieth year—some rethought their opposition to government-mandated equality. They knew that Rabbinic Jews regarded the Jubilee legislation as having gone into abeyance. But this later history was irrelevant for Christian thinkers, who considered the original law sufficient proof that God endorsed the principle of the equal distribution of property. By the end of the seventeenth century, spurred by this conviction, republican political theorists had made redistribution one of their fundamental values. The final chapter explores how rabbinical sources contributed to the rise of religious toleration in the seventeenth and eighteenth centuries. Paradoxically, the conviction of Protestant scholars that God had instituted a theocracy in ancient Israel led them to conclude that modern European rulers could not constrain religious freedom. The Mosaic law, they reasoned, was rife with religious precepts only because the national sovereign was also its deity, the God of Israel. The Israelite subject’s duty to his sovereign was thus a religious obligation. But it followed that when the civil sovereign was notGod, as was the case in early modern Europe, the subject’s duties were civic, not religious, in nature. An ordinary human sovereign had no right to make confessional demands on his subjects. Thus, Nelson concludes, religious toleration was rooted at least in part in religious faith. Throughout his book, Nelson studiously avoids getting involved with contemporary debates about religion and politics. Yet they bubble not far below the surface. In fact, The Hebrew Republic is part of a much larger revival of a field, “political Hebraism,” which has always had a powerful political valence. In the 1980s, its flagship was Michael Walzer’s left-liberal Exodus and Revolution. More recently, political Hebraism has moved to the right: much of the work in the field now takes place under the aegis of the conservative Shalem Center in Jerusalem. Though it supports many projects, some with no immediate political resonance, Shalem has been particularly attentive to scholars who have sought to show the Jewish roots not only of democracy but also of present-day conservative politics. It is Nelson’s effort to develop a new account of modernity that really brings contemporary politics to the surface of his book. Since the end of the Cold War, there has been a growing debate in the West over the proper place of religion in public life. The Swiss ban on minaret construction and the Texas school board’s erasure of the “atheist” Thomas Jefferson from its curriculum are just two of the most recent salvoes. Academia has not been deaf to this ongoing debate. Scholars working on modernity—and there are more and more of them as post-modernism’s star wanes—have revived the venerable view of secularization as a key ingredient in Western modernity. In different ways, both Mark Lilla’s The Stillborn God and Jonathan Israel’s ongoing Radical Enlightenment trilogy link modernity’s rise to the decline of religion. Nelson’s book nonetheless falls into two of the same historical problems that bedeviled Lilla’s and Israel’s studies. In the technical language of historiography, the earlier books constructed teleological histories of a reified concept of modernity. In plain English, these writers identified modernity with certain concepts or ideas – toleration, for example -- and produced narratives that show how those concepts ended up being adopted by the West. This type of argument is widespread in political theory and philosophy, but for historians it raises significant objections. For one thing, it is not at all self-evident that the values which these scholars identify as fundamental components of Western modernity are in fact so deeply rooted or immutable. Empires ruled by monarchs, after all, were still the dominant force in Europe until the end of the World War I—long after the appearance of “modernity” in the eighteenth century. To this day, right-wing parties in Europe and the United States run against the redistribution of wealth in virtually every election. And religious toleration, in Europe at least, seems to be in the process of contracting rather than expanding. Do these facts mean that the West does not really hold these values, or that we profess them hypocritically? Not at all. But they do suggest that we cannot simply assume that they are foundational elements of Western modernity. They are, instead, always contested and forever in play. Historians may also object to the way these authors affix the label “modern” to seventeenth- and eighteenth-century ideas. Nelson is more careful about this than Lilla and Israel, but in the final equation, he, too, wants to see ideas such as the redistribution of wealth and kingless government as the harbingers of modernity. The danger here is that early modern history becomes a kind of prelude or backstory to the “real” narrative—the “modern” story—and that its specificity and peculiarity are stripped away in order to foreground its relationship to who we are today. Nelson is too good an historian to do this, but the tilt of his book is likely to launch more than a few of his readers down that slippery slope. These concerns in no way tarnish Nelson’s achievement in The Hebrew Republic. Not only has he significantly revised the history of some key concepts in early modern European political thought. It may be that he has written a paradigm-shifter, the kind of book that fundamentally realigns the way scholars look at a period as a whole. Scholars’ faith in the Bible, Nelson shows, led them to shape early modern political thought around the Hebrew Republic. Yet despite long-standing trading relationships with anthropology and religious studies, history as discipline still has trouble thinking about the experience of religiosity. It is not just that the sources are problematic, often subjective and cryptic. There is also a resistance to seeing religiosity as a unique category of experience, one which is not reducible to social status, gender, political ideology or any of a host of other variables. The Hebrew Republic demonstrates unforgettably that we need to understand piety to comprehend politics. This will not be news to scholars working on the Middle East or the Middle Ages. But for many historians of European and American politics and political thought, The Hebrew Republic may help force belief—not just religious institutions—back into the center of the story. Somewhere John Milton is smiling. Nathan Perl-Rosenthal is a PhD candidate at Columbia University in American and European history.